This white paper describes how the software as a service (SaaS) model delivers financial, implementation and operational benefits to job shops and small manufacturers. 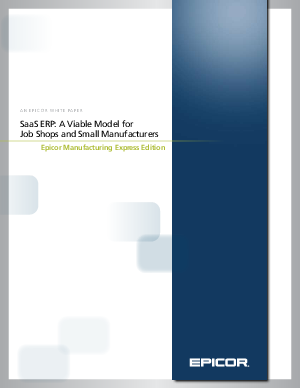 It also describes how Epicor Manufacturing Express Edition, a comprehensive ERP system deployed in the SaaS model, meets the needs of job shops and small manufacturers. With Epicor Express, job shops and small manufacturers now have the opportunity to implement an ERP solution that can help transform their operations and business.